All entries must be accompanied by an entry form signed by the child's parent or guardian. Please make sure you print clearly as we use the information on the entry forms to create certificates of achievement, to mail back stories, and to communicate with parents via email. You can access the entry form and rules here as a PDF file, or you can contact the NHPBS via email or by calling 1-603-868-4455 to request an entry form. MANY WILL ENTER, ALL WILL WIN. NO PURCHASE NECESSARY TO ENTER OR WIN. The NHPBS KIDS Writers Contest is produced by NHPBS and is based on the Reading Rainbow® Young Writers and Illustrators Contest, a concept developed by WNED. The Contest begins on September 1, 2018. Entry deadline is March 1, 2019. This Contest consists of two (2) rounds of judging: (1) the in-house judging, and (2) the New Hampshire judging panel. 10-20 stories at each grade level will be selected by NHPBS staff as outstanding stories for that grade level. Those stories will be judged by a panel of judges made up of, but not limited to, New Hampshire teachers, librarians, business leaders, artists, and writers. A first, second and third place winner will be selected for each grade level. The remaining stories in each judging group will be awarded an honorable mention. All other stories will be awarded an Outstanding Achievement Award. Entrants must be children in kindergarten, first, second, third, fourth, or fifth grade. Children of employees of NHPBS are not eligible. Stories can be fact or fiction, prose, or poetry. Fourth and fifth grade stories must have a minimum of 150 words and a maximum of 500 words. The word count includes “a,” “an,” and “the,” but not the words on non-story pages such as the title page or those that enhance the illustrations. Original art can include drawings, collages, and 3-D art created by the author or photographs taken by the author. Each entry must include the official NHPBS KIDS Writers Contest Entry Form, with the required signature of a parent/guardian (and, if appropriate, the optional signature of the sponsoring teacher), consenting to allowing their child/ward to enter the Contest, confirming that the story and art are original, and granting certain rights to the entry materials. The entry form must be complete and legible to be eligible. All decisions of the judges are final and binding and not subject to appeal or review. NHPBS will make every effort to return all stories. NHPBS is not responsible for late, lost, stolen, misdirected, damaged, mutilated, incomplete, returned, or illegible entries, or postage-due mail. Submission of the Entry Form constitutes permission from the participant’s parent/legal guardian for NHPBS to use the participants’ name, likeness, biographical information, information and materials contained in the Entry Form, photographs, and any statements or remarks made about the Contest in advertising and promotion without further compensation or permission, except where prohibited by law. All entries, and any copyrights therein, become the sole property of NHPBS. By entering, entrants’ parent/legal guardian agree to abide by the above stated rules, and warrant that their child’s/ward’s entry is their original work and does not infringe upon or violate rights of any third party, and grant to NHPBS the right to edit, publish, promote, and otherwise use their entry materials without permission, notice or compensation. No royalties will be paid at this or any time. By submitting an entry and Entry Form, each participant’s parent/legal guardian, on behalf of the participant, agrees to assign all right, title, and interest in and to the entry and Entry Form to NHPBS and warrants that the participant’s parent/legal guardian has the authority to assign such right, title, and interest. In the event that any applicable law requires certain formalities to be fulfilled to effectuate such grant of rights, each participant (and parent or guardian) agrees to cooperate with NHPBS to achieve fulfillment of such formalities. By submitting an Entry Form, each participant’s parent/legal guardian, on behalf of participant, agrees to be bound by these Contest Rules. Each participant’s parent/legal guardian, on behalf of the participant, agrees to release and hold NHPBS, and its employees, officers, directors, shareholders, agents, representatives, subsidiaries, parent companies, or other affiliated companies harmless from any and all damages, losses, claims and liabilities arising out of participation in the Contest or resulting from acceptance or claiming of any prize hereunder. NHPBS reserves the right, in its sole discretion, to terminate, suspend or otherwise cancel the Contest at any time. Income and all other taxes are the responsibility of the prize recipient. NHPBS is not responsible for any expenses incurred in connection with participation in the Contest. Privacy: Unless otherwise specified, any and all information connected in connection with this Contest will be used by NHPBS solely for the purpose of administering and promoting the Contest and other opportunities for young children available from NHPBS. Is it important to follow the word count? Yes! We count the words of stories. Any story that goes over or under the required word count may not be eligible for consideration as a winning story. Word count. If you are in kindergarten or first grade, your story needs to be at least 50 words and no more than 200 words. If you are in second or third grade, your story needs to be at least 100 words and no more than 350 words. If you are in fourth or fifth grade, your story needs to be at least 200 words and no more than 500 words. When you're counting words, include "a," "an," and "the" when they're in your story. Don't count words on non-story pages such as the title page, dedications, about the author sections, or the words included in an illustration. No! The judges are asked not to count off for spelling errors, but it is never a bad idea to check your spelling and your grammar! Who is eligible to submit stories to the contest? Children in grades K-5 are invited to participate. Stories must be postmarked by March 1, 2019. Complete the entry form and mail the form along with the story to NHPBS. 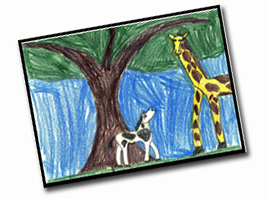 Please send these entries to: NHPBS KIDS Writers Contest, 268 Mast Road, Durham, NH 03824. If you have any questions, e-mail us or call 1-603-868-4455. Stories will be judged in May. They are judged on the quality of the art, the quality of the writing, and how well the art and the writing work together. Some things that make a story special include bright, colorful art; a unique story; a story with a good beginning, middle, and end; illustrations that match the story; attention to details; and following the contest rules! All the stories submitted to New Hampshire PBS are read by the staff. Outstanding stories at each grade level are chosen for judging by a panel of judges made up of teachers, librarians, authors, artists, and NHPBS staff. This panel selects a first, second, and third place winner at each grade level. The remaining stories selected for judging are awarded an honorable mention. First, second, and third place winners are notified by phone after judging is completed and a list of winning stories is posted on the NHPBS KIDS WRITERS CONTEST website the next morning. First, Second and Third Place winners and honorable mention winners are notified by phone or email following judging. The winners' names are posted on this contest website. Can I enter a story from out-of-state? Yes, we welcome all stories. Are you working on a story for the CONTEST? Are you struggling with writer's block, having a hard time editing, or maybe you are having a hard time getting started. Not to worry, Julianna has some writing tips for you!